Pass It Down put's a biographer in everyone's pocket. 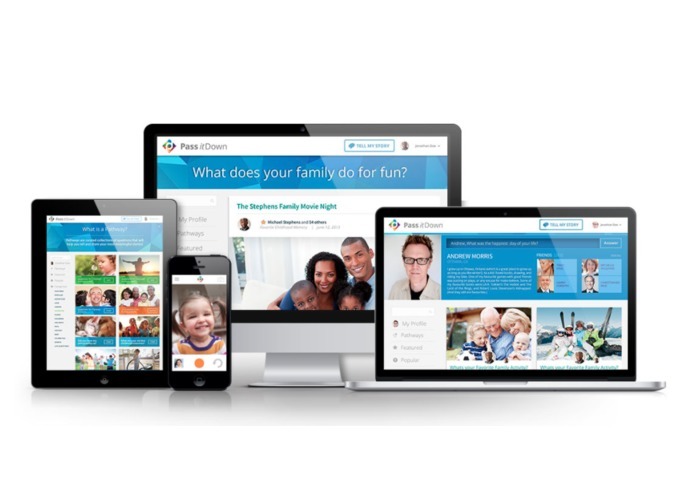 Use your phone, tablet, or computer to capture your family's cherished memories. Pass It Down has categorized 100's of questions to make it easy to find the topics you are interested in. First, choose a question. Next, choose how you want to tell your story. Pass It Down supports video, audio, text and photos. 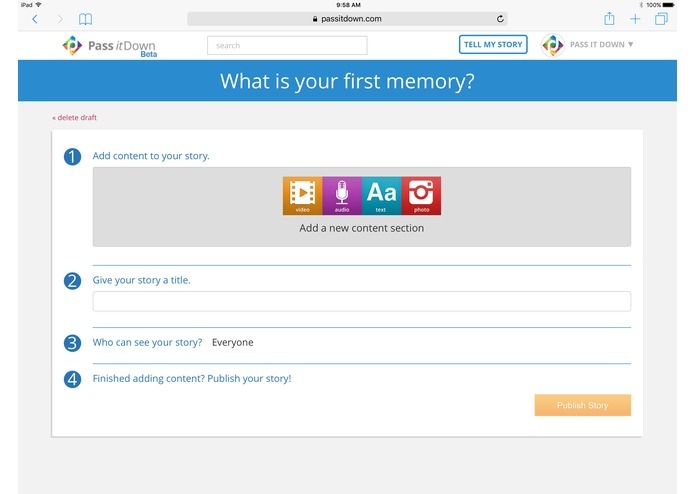 Pass It Down displays your stories beautifully and gives you the flexibility to choose who can view every precious memory. 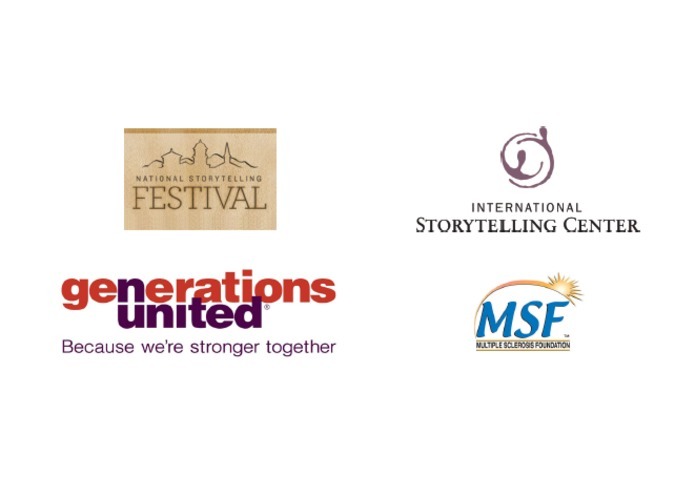 We have some amazing partnerships including the International Storytelling Center & the National Storytelling Festival. What is Pass It Down? Imagine if you could go back and hear and see your loved ones speak about their life. 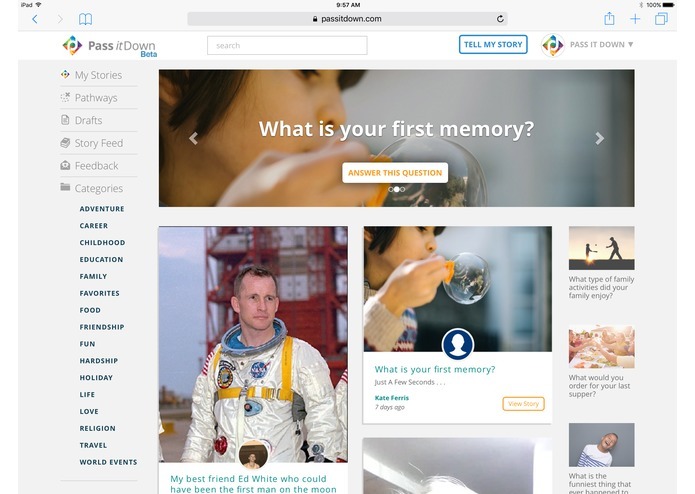 Chris Cummings, Founder & CEO, established Pass It Down to help people capture their family stories after his mother developed early on-set dementia at the age of 48. Pass It Down is the best way for people everywhere to capture their life stories and share those with friends, family and the world. Using your phone, tablet, or computer, you can ask and answer questions provided by oral historians to capture family stories. Stories can be captured in video, audio, text and photos and then shared publicly, with friends and family, or kept privately like a journal. Among the storytelling platforms in the market, like StoryCorp and StoryWorth, Pass It Down features the: best design, is the easiest to use, supports full multi-media storytelling, contains the most social functions, and is the price performance leader. Pass It Down is strategically partnered with the International Storytelling Center who helps guide our unique and trailblazing storytelling methodology. 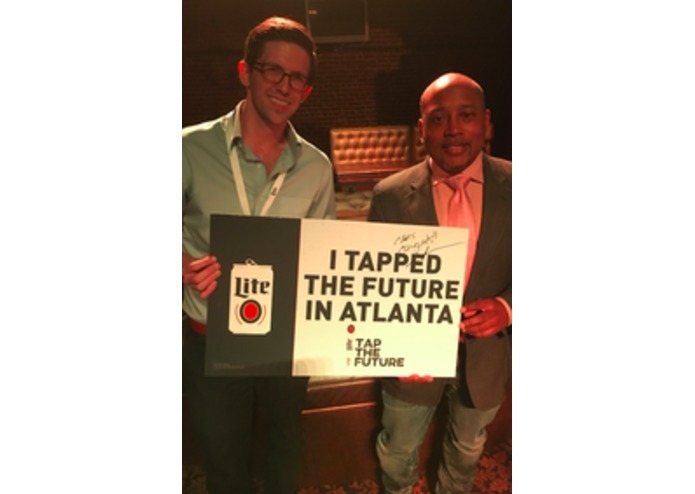 Pass It Down competed in Miller Lite’s Tap The Future competition which seeks to find the most innovative startups from around the country. Pass It Down won the regional semi-final, and $22,000, in a contest judged by Daymond John, Everette Taylor, and other national judges. Pass It Down came very close to winning the final but was happy to finish as one of the top innovators in the country for 2016. Pass It Down won the 2016 Business to Consumer Award at the Chattanooga Startup Awards during Chattanooga's startup week. Pass It Down was also one of three finalists for Chattanooga's Startup of the Year award. Pass It Down was one of 12 companies accepted to attend the prestigious GigTank Accelerator this past summer. GigTank is a boutique accelerator for startups developing high-bandwidth business applications. Pass It Down is a web-based app (with native applications coming soon) that works in any browser on a phone, tablet or computer. We are launching the Pass It Down platform for the 2016 holiday season as a freemium product. Pass It Down is able to offer the platform for free because Amazon has given Pass It Down over $100,000 in AWS credits to allow us to focus on user growth and acquisition. Pass It Down will be introducing premium feature sets in 2017. Our business model is built on multiple revenue streams including targeted advertisements, licenses and partnerships, and physical products like greetingStory. We've had an incredible feedback and response from oral historians and families around the country and can't wait to launch our platform. At Pass It Down, we believe that team is everything and is the most important factor behind being a successful startup. 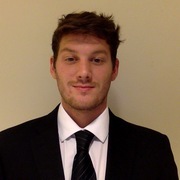 Chris Cummings, our Founder and CEO, is an entrepreneur and attorney with over 10 years of experience in the software industry. 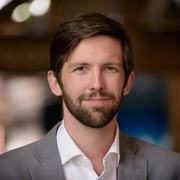 Prior to founding Pass It Down, Chris cofounded Woople, a learning management system that has delivered over 50 million minutes of educational content to Fortune 500 companies around the world. Ted Finch, our Chief Marketing Officer, has launched over 450 products for over 200 vendors (including Microsoft, HP, Adobe, Intel, Epson, Novel, Autodesk, Citrix, IBM, Western Digital, Sony, Disney, Netscape, and more). He is the former VP of Marketing at Harcourt, Sr. VP at Motorola, and a VP at GE. In addition, he led the marketing team that published Netscape. Rodger Maarfi, Chief Technology Officer Rodger is a full-stack developer and mobile developer with over 15 years of experience in the software industry. As the CTO of Woople, Rodger led the redevelopment of the Woople platform which has delivered over 50 million minutes of educational content across the globe. Victoria Bruck, Social Media Coordinator Victoria creates engaging content across multiple social media channels, manages our online community, and analyzes the performance of our social media campaigns. She’s interested in all things social media, being outdoors, and making & preserving memories that last a lifetime. Our development team has over 30 years of experience in building successful and scalable technology products for companies around the world. Our Mission We at Pass It Down believe that every person has a story to tell and a legacy worth preserving. We believe the greatest loss is a story that's not told. Stories are our lifeline to previous and future generations. Don't let the memories- the stories- pass you by. Pass them down. Pass It Down will be launching this holiday season! We are excited to unveil our platform to the world and have several conferences and events lined up in the coming months. We will also be unveiling our iOS applications this spring.